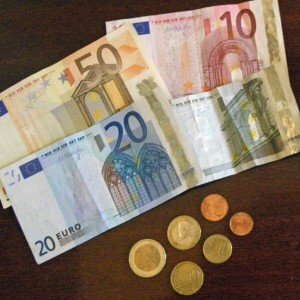 Last week’s post on Managing Money on a European Vacation focused on pre-trip planning, cash, and credit cards. Today’s post will continue that discussion to focus on security issues. Travel in Europe is usually very safe. Violent crime is extremely unusual, but theft is more common, perhaps more so now with high unemployment in parts of Europe. As a tourist in an unfamiliar place, it’s important to take precautions to protect your money and unauthorized access to your accounts. Loss of your cash, credit cards or passport can be expensive and inconvenient, turning your long-awaited vacation into a very unpleasant experience. 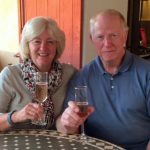 Other members of Slow Travel Tours join us in offering suggestions for protecting your money while traveling in Europe. Always be alert, especially in crowded places. Don’t carry much cash and always carry it in a safe place. If you have a bank account with no ATM fees (see last week’s post), you can visit the ATM machine more often and don’t need to carry so much money. Don’t bring credit cards to Europe that you don’t need. Keep your back-up ATM and credit cards in a separate place from the main cards you plan to use. Make copies of your ATM and credit cards and keep these copies in a separate place from your cash and cards. Don’t bring valuables—like expensive jewelry—with you. We’ve always tried to be careful using ATMs—not just in Europe but at home too. We choose the machine location carefully, visit during daylight hours, make sure we have privacy, and use our hands to conceal the PIN. We count our cash securely and put it away before turning away from the machine. These are all important security practices. Then one day, after almost 20 years of using ATMs in Europe, we had a major problem while in Europe for the summer: we were victims of fraudulent activity in our bank account. I was lucky to catch this early because I check our account every few days when we’re traveling. I noticed several withdrawals over the past two or three days from different ATMs in Marseille, about an hour and a half from where we were based. We hadn’t been to Marseille—and neither of our ATM cards were missing! We immediately contacted our bank and our accounts were frozen. Fortunately, our losses were covered and we had carried cards to access an account at another bank. It appeared that our account information had somehow been compromised at an ATM in a busy village… perhaps by a “skimmer” affixed to the machine by an enterprising thief. Shannon also recommended signing up for text or email alerts so you’re notified if your credit card is used. Or you may be able to check your bank and credit card accounts regularly like we do while we’re traveling—from a secure internet connection, of course. Pickpockets can be a problem in some European cities, and we have several friends who have lost cash, cards and even passports while traveling. Be alert in crowded places like this market. Jim Nilsen of Photography Travel Tours also recommended money belts. He travels with a lightweight money belt where he keeps extra cash and credit cards. Jim also tries not to have too much money in his wallet… just enough for the day. I normally don’t use a money belt, but I always carry my purse or backpack in front of me in busy places, with one arm across the bag. Ten years ago a woman pickpocket targeted me at the busy Charles Bridge in Prague. Suddenly I felt someone pressed right up behind me, hands in both my coat pockets. I wheeled around and shouted, and she moved on to someone else. Luckily I didn’t have anything in my pockets, but that experience made me much more cautious in crowded, unfamiliar places. We have two friends who were pickpocketed on busy trains in Italy; one friend lost his passport, which creates many more issues than the loss of money. Pickpockets sometimes work in pairs. One will distract an unsuspecting tourist, perhaps asking for directions or offering to help, while the other moves in to take a wallet or purse. A friend recently told me about a scam in Barcelona. One thief splashed paint on a tourist’s suitcase in a busy train station. A second thief stopped to offer to help. In the midst of these distractions, a third thief moved in to steal the flustered traveler’s purse. A few years ago an acquaintance– an experience European traveler– had her handbag stolen in Paris in a busy restaurant. She left it hanging on the back of her chair while she was enjoying a last dinner in Paris. See her blog for details of this sad story… definitely a “lessons learned” for other travelers. I heard a similar story about a woman who left her purse under the table in a big city internet café. More than the loss of her money and credit cards, she was devastated by the loss of her camera and travel journal. When traveling independently by car, be very mindful of leaving valuables exposed in your parked car. If you must carry luggage because you’re changing locations, always lock your luggage in the trunk and if possible, back your car against a wall so the trunk isn’t accessible. Never leave computer bags or camera bags visible in the back seat. In your European travels you may encounter various types of scams in cities and busy places that attract tourists. You may see beggars, some who may approach you. Some are legitimate people in need but others are not. (I once saw an old woman prostate on a bridge in Rome pull up her headscarf to look at the money in her bowl… to my shock, it was a young man under that scarf!) If you want to offer a few coins, be very careful not to pull out your wallet or billfold. 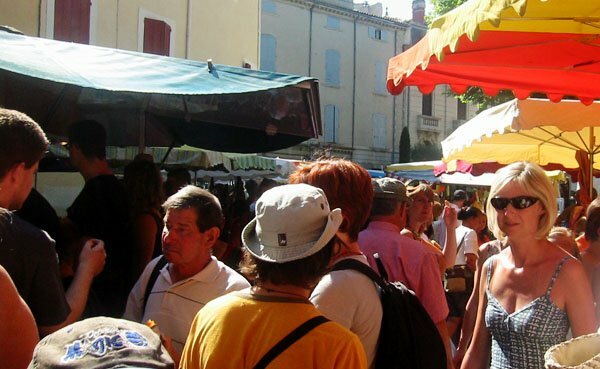 At the markets in Provence we warn people about cheese sellers who offer samples of cheese from big wheels at attractively-decorated booths. The cheese is delicious, but incredibly expensive. An unsuspecting tourist may end up with a 30 euro slab of cheese. Another “scam” we see at markets involves a cart with adorable baby animals… perhaps a goat, pig, or kittens. The attendants are usually offering a throat lozenge of some sort in exchange for a “donation.” We really doubt that the contribution goes to support baby animals in need. A vacation in Europe is normally a wonderful experience, and we’re sure you’ll encounter many very friendly and helpful people, just as we have. Don’t let a moment of carelessness make your vacation the wrong kind of memory. Always be alert and be cautious—especially in crowded places.